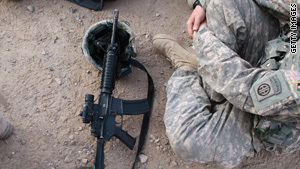 A U.S. Army soldier sits with his rifle on the ground during a meeting of Pashtun leaders Monday in Afghanistan. Washington (CNN) -- The Pentagon on Tuesday identified four U.S. Marines who died in one of two helicopter collisions Monday in Afghanistan. Ten Americans died in the second crash, including three Drug Enforcement Administration special agents. They were the first DEA agents to be killed in Afghanistan. Their names and those of the seven other victims have not been released. The four Marines who died while supporting combat operations in Helmand province in southern Afghanistan were Cpl. Gregory M.W. Fleury, 23, of Anchorage, Alaska; Capt. Eric A. Jones, 29, of Westchester, New York; Capt. David S. Mitchell, 30, of Loveland, Ohio; and Capt. Kyle R. Van De Giesen, 29, of North Attleboro, Massachusetts. "Like all those who give their lives in service to America, they were doing their duty, and they were doing this nation proud," President Obama said Monday at the Naval Air Station in Jacksonville, Florida. "Now, it is our duty, as a nation, to keep their memory alive in our hearts and to carry on their work, to take care of their families, to keep our country safe," Obama said. The 14 deaths were the largest number of Americans killed in Afghanistan in a single day in more than four years, according to CNN records. The four Marines were killed when two helicopters apparently collided in the air in southern Afghanistan. Two other NATO service members were injured. "The incident is currently being investigated, but it is confirmed that hostile fire was not involved," the International Security Assistance Force said. The ISAF said enemy action was not thought to be the cause of the other, more deadly crash, either. The helicopter in the crash that killed 10 was returning from a raid on a compound believed to be harboring insurgents tied to drug trafficking. The crash was in western Afghanistan. Seven U.S. service members and three U.S. civilians were killed, according to an ISAF statement. The crash also injured 14 Afghan service members, 11 U.S. service members and one U.S. civilian. The militants were killed in a firefight when they confronted the joint force, ISAF said. As the force was leaving, a helicopter "went down due to unconfirmed reasons," ISAF said. The DEA has had a presence in Afghanistan for four years. The agency said Monday that it is increasing its presence in Kabul to up to about 50 agents.